A classic American success story: in 1913, Irving and Jack Schott, sons of Russian immigrants, started producing raincoats in a basement in the Lower East Side of Manhattan. After only two years, they opened a factory in Staten Island, NY, and soon Schott NYC claimed to be the first brand to “put a zipper on a jacket”. In 1928, Irving Schott designed and produced the first leather motorcycle jacket: The Perfecto, named after Irving Schott’s favorite cigar. Later, James Dean and his Perfecto became inseparable, furthering its iconic status – the Perfecto became a symbol of rebellion, and was temporarily even banned by schools. 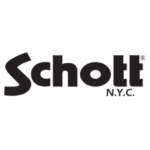 Today, the fourth generation of the Schott family still produces the core of its range, now including, among leather jackets and motorcycle apparel, also a large range of cloth products and accessories, in the nearly 100 year old factory right of outside of New York City. Quality, innovation, and individuality remain the main principles of Schott NYC – a real American original.